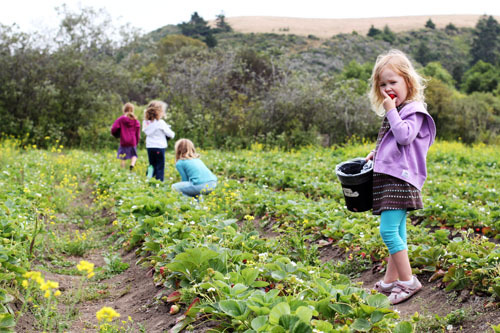 Before the girls left for the Cape we went berry picking with some friends in beautiful Pescadero, CA. I’ve already made our jam for the year, so it was no-stress berry picking. And I can’t believe how much fun the girls had. They would have stayed there all day picking berries if we had let them. I need to remember to do this every year, whether we come home with berries or not. My little family gets back tomorrow night, but then I take off for two days for the BlogHer conference, so it’s kind of a crazy week. – Homemade pizza…and I think we’ll give it a try with our new pizza stone on the grill! – I will be at BlogHer! Okay people, bring it on! Share your menus! 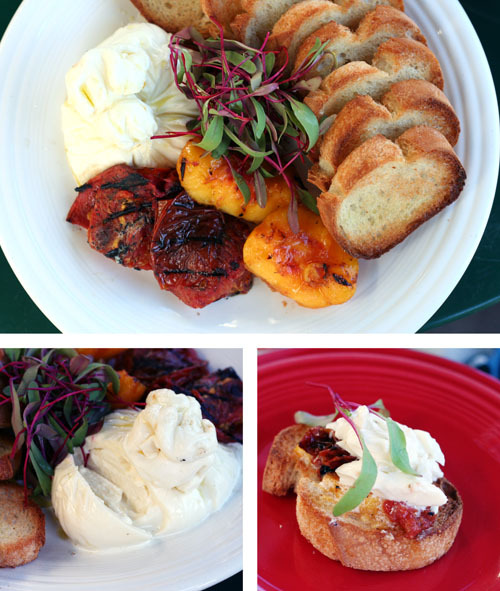 This past Monday I went to Edgewood Eats for dinner. And ate delicious food. And had a blast. And went home happy. You may be wondering what Edgewood Eats is. Every Monday, a bunch of gourmet food trucks from around the Bay Area come to an old, nearly-abandoned shopping plaza (that has a real-live, totally awesome wig store, by the way) to serve food from 5-8 pm. Everyone brings blankets and chairs and just sits down on the sidewalk to eat. There is always a great variety of food and lots of people to see. And, yes, it’s every bit as wonderful as you’re imagining. I went with two friends on Monday, so we each got food from different trucks and then divided the spoils between us. And stuffed ourselves silly with Thai, barbecue and Mexican food. And reluctantly resisted all of the other amazing foods that were available (Vietnamese, curry, seafood, Filipino, desserts and more desserts). If you don’t live anywhere near Palo Alto, go out and find your own fun, local food find this weekend. And tell us about it. Because someone reading will live near you and want to know about it! Grilling Galore…and a Mr. Bar-B-Q Giveaway…and Amazing Recipes for the Grill! This giveaway is now closed. But don’t miss the great grilling recipes at the end of the post! I love grilling. And not just because grilled food is delicious. But because I usually hand over the grilling responsibilities to Nate. My kitchen stays cool and I get a man to cook for me. It’s heaven. When Mr. Bar-B-Q contacted me about a giveaway and offered to send some fun grilling accessories, I jumped on the offer. Because Nate seriously does love grilling and I figured a few new tools might get him in front of the BBQ even more this summer. 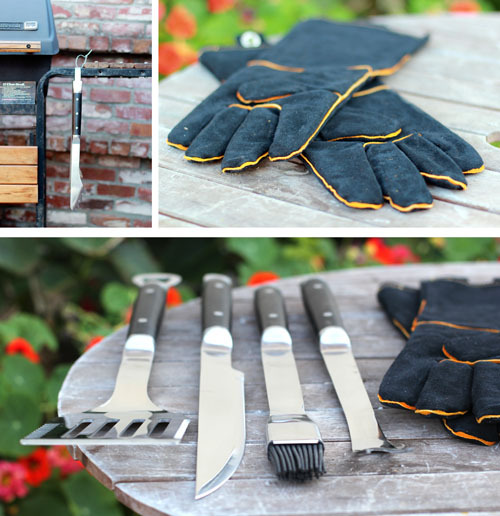 Mr. Bar-B-Q sent us some some beautiful grilling tools, a pair of heavy-duty gloves (Nate is most excited about those! ), and a pizza stone for the grill. We haven’t used the stone yet, but I am most excited about that one for sure. There have been a few times this summer when we’ve really wanted homemade pizza, but firing up the oven to 500 degrees in the summer heat is the last thing I want to do. Enter pizza stone on the grill – woo-hoo! I cannot wait to give it a try! To inspire you to have some fun at the grill this summer, I have two “gifts” for you today. First, a giveaway from Mr. Bar-B-Q. 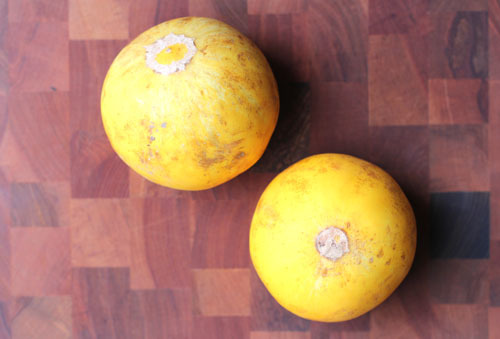 Second, favorite grilling recipes from some of my favorite food bloggers. Do you think you can handle all this grilling love? I thought so…here we go! Mr. Bar-B-Q wants to help you find your inner Mr. or Mrs. Bar-B-Q by giving away a Mr. Bar-B-Q Grill Stone Pizza Kit (which includes a 15″ round grill top pizza stone and a folding pizza shovel) and a Mr. Bar-B-Q 18-Piece Stainless-Steel Grill Tool Set. Imagine the fun you could have at your next barbecue! To enter the giveaway, please leave a “juicy” comment…you know, spill the beans on your favorite grilling recipe, memory, tips, sauces and more! Comments must be made by Midnight PT on Monday, August 1. One winner will be announced on August 2. I can’t wait to see your juicy comments! BONUS: if you “like” Mr. Bar-B-Q on Facebook, please add a second comment to this post to get an additional entry in the giveaway! In anticipation of today’s great giveaway, I emailed a handful of my dearest food blogging friends and asked them to share their favorite grilling recipes. Between the Mr. Bar-B-Q giveaway and these fabulous recipes, you should be feeling pretty darn inspired to have a lot of fun at the grill this summer! Filipino Chicken Barbecue (Inihaw na manok) from Erika of Ivory Hut…she mentioned that you really must make the Achara (Pickled Green Papaya) side dish to go with the barbecue. And, you should listen to her. Beef Kebobs from Elise at Simply Recipes. She tells me they’re great! Lime Cumin Marinated Skirt Steaks from Vanessa at Chef Druck Musings. Are you kidding, Vanessa? That sounds amazing! Grilled Guacamole from Maria at Two Peas and Their Pod. Yes, you read that correctly…grilled guacamole. Maria said the smoky flavor is oh-so-nice. And, last but certainly not least, Pizza on the Grill, Greek-Style from Three Many Cooks. YUM. I was telling my friend Gudrun the last thing I want to do this week is plan a menu! I love having each day’s food plans up in the air, subject to my every pregnant whim! So, I’m not really planning a menu this week. I’m taking a break. This doesn’t mean I’m not going to cook, in fact, I would love it if you share your favorite thing to make when you’re cooking for one. I would also like to applaud everyone out there who regularly cooks for one AND plans a menu each week. I am very impressed with your discipline! I completely believe in menu planning and think it makes everyone’s life easier…whether you are just cooking for yourself or for a group of people. BUT…that said…when you don’t have that group of people expecting dinner, it’s just so easy to not plan ahead. So, bravo to you menu-planning single folks! 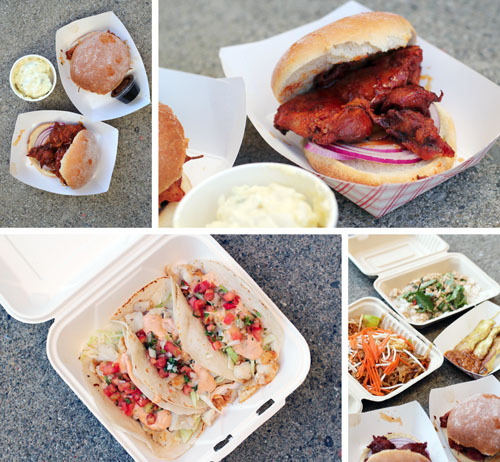 – Going to try out the food carts at Edgewood Eats – so excited! – I didn’t get the Mushroom Soup at Draeger’s last week, so I’m getting it this week! Since I’m providing pretty much zero food inspiration this week, please pretty please share your menu for the week! You need to inspire one another…and me! And remember to share your favorite meals for one – would love to get some ideas for the week! The first time I planted tomatoes, the plants died. I’m 99.9999% sure the soil in our garden plot was diseased, so I don’t blame myself entirely. But it still felt like a big failure. This year I decided to give tomato growing another go. I had several friends tell me they had great success growing tomato plants in pots, so I decided that would be our approach this time. And, so far, so good. No diseased soil. My plants are staked and growing upward. I’ve fertilized every 7-10 days. I’ve taken care of the suckers. And we’ve actually gotten some tomatoes this year (they sure were yummy in the watermelon salad). Woo-hoo! But then…then…last week, I went to my friend Natalee’s house for dinner and saw THIS on her back porch. Just to give some perspective, this is my pot of tomatoes compared to Natalee’s. Left: My ‘Charlie Brown Christmas’ tomato plant. Well-loved, but seriously more of a novelty at this point. Right: Natalee’s organic behemoth of a tomato plant. Both of our planters only have two tomato plants planted. And they get the same exact sun exposure. And yet, it’s downright stunning how different our plants are. I asked Natalee what in the world she did. 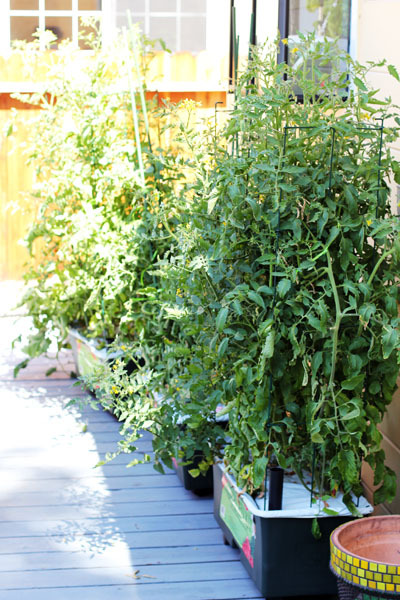 She and I are at about the same level of tomato growing expertise, so her bounteous plants give me hope that one day I will be able to to grow decent tomatoes. She used an EarthBox garden kit. Natalee swears by this system. 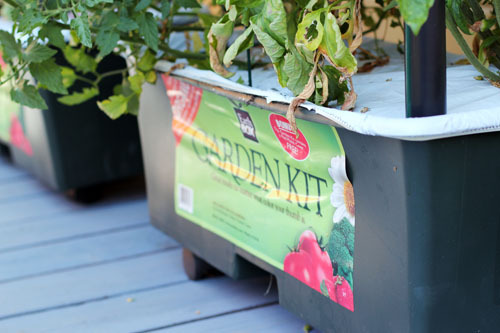 It basically allows you to water your plants perfectly and you can grow all kinds of vegetables in them. Natalee bought her EarthBox planters at one of our local nurseries, but you can also buy them online, and you can use them year after year. She used a soil that the local nursery recommended highly for growing tomatoes. Apparently that soil has a little pixie dust mixed in because seriously, look at those plants! That is ALL she did differently than me. The pot was a little different and the soil was tailored for tomato growing. When I first saw the plants, she hadn’t even fertilized them yet, if you can believe it! She’s still planning to fertilize, of course, but, yeah, whatever. Her tomato plants are still knocking my socks off. Maybe next year I’ll actually get tomato-growing all figured out! Calling all green thumbs! 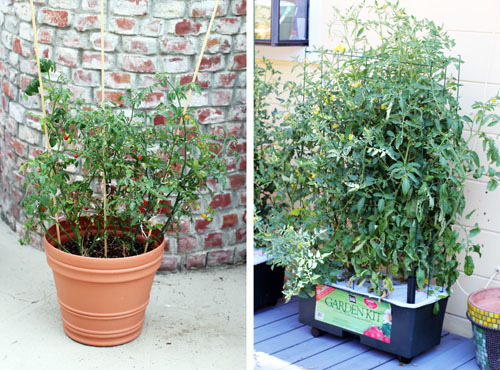 If you actually know what you are doing with tomato plants, please share your tips! Last Friday night I did something I haven’t done in a while…I actually picked up a magazine (in this case Martha Stewart Living) and read it cover to cover. And I’ve decided I should do that more often because I was inspired to make a fabulous dinner on Sunday night. Of course, by the end of preparing all the food my sciatic nerve was literally screaming at me and I hobbled around the rest of the night (yes, I’m officially a hobbling pregnant woman…no more heels for me, boo-hoo! ), but our dinner was worth the pain. One of Sunday night’s creations was a Watermelon Salad with Tomato and Cucumber. There was a recipe for this salad featured in the magazine that involved making a fancy basil oil. I’m sure it’s wonderful, but I simplified things a bit in my preparation. I loved the salad – super easy to prepare and the oh-so-summery flavors all blended so nicely together. I wasn’t entirely sure what the girls would think. 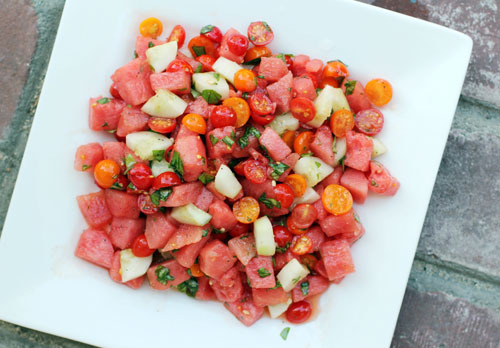 They love watermelon, and this savory twist on a favorite fruit seemed a bit risky. But I’ll tell you what…every person in the family happily gobbled down the salad! It was a great success! Will definitely be adding this salad to the rotation, at least during the summer when all of these lovely ingredients are fresh and in season! Original recipe calls for 4 oz crumbled goat cheese – I left this out because we were having another cheese-based side dish, but also I just wanted straight up produce in the salad. Commenter Jennifer below mentioned using Ricotta Salata instead of goat cheese and that is what I'm going to use from now on! 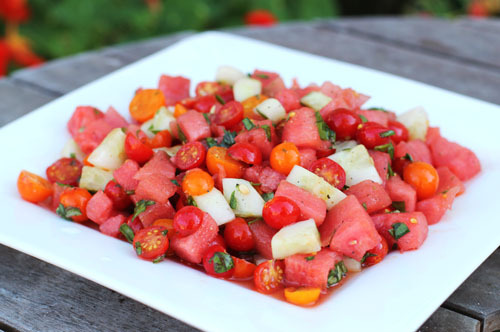 Combine the watermelon, tomatoes and cucumber in a large bowl. Drizzle with olive oil, just enough to cover the fruit and veggies. Sprinkle with the chopped basil, about ½ tsp salt and pepper to taste. Toss to coat evenly and serve! I received this banana bread recipe from my dear friend and fellow graphic designer Julie in Boston about 10 years ago. She brought the bread to work one day and my recipe radar immediately started buzzing. Of course I asked for the recipe, which she graciously shared with me the next day…on a piece of paper, in her handwriting, complete with a little sketch of a monkey holding bananas. About five years ago I digitized all my recipes (i.e. sat down and typed them all into the computer for hours on end…digitized sounds cooler, though). Despite the digitization, I still hang onto my recipe card box. It’s a treasure. All those recipes, lovingly hand written, complete with notes, sketches, and, sometimes, the handwriting of loved ones who have since passed. I can still picture many of those handwritten recipe cards, even when I’m looking at a typed version on the computer or iPad. Like with this bread. That little monkey will never leave my brain and always reminds me of happy times in the design studio with Julie. 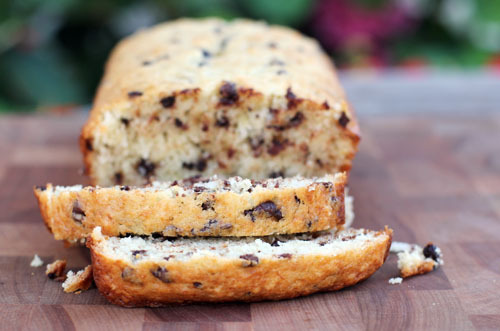 This banana bread is soooooooo good. 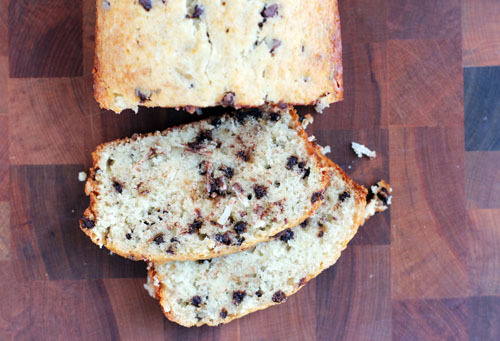 A little lighter in texture than other banana breads, but still very moist. I brought it to a party last weekend and people were gushing. And I feel like I can say that with total humility since it’s not my original recipe. ALTHOUGH…my tweaks have put it over the edge, if I do say so myself. (Okay, humility out the window!) The original recipe calls for nuts, which I hate in my baked goods. Instead, I put in coconut. It’s so awesome. Also, I try to use mini chocolate chips whenever I can. 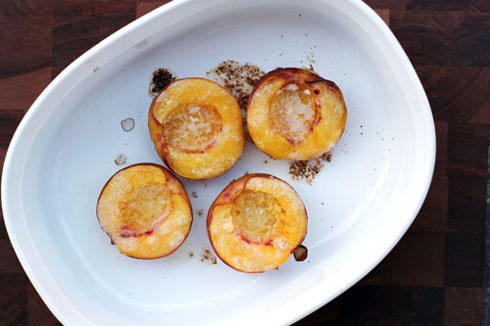 They distribute beautifully through the bread and are perfect for this recipe. 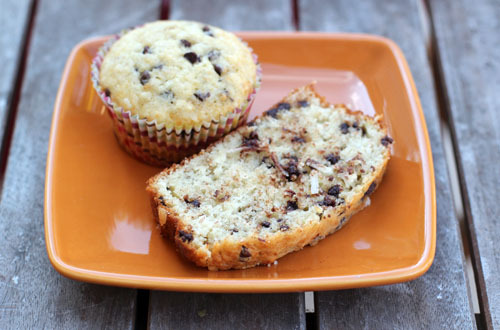 That’s not to say that if you use regular chocolate chips you won’t be happy…you will. But the minis kind of rock it. Preheat oven to 350, grease bottom only of 2 loaf pans. Mix sugar with margarine/butter. (Jane note: I use my beloved pastry blender to do the mixing until the point when I add the dry ingredients.) Stir in eggs. Add bananas, buttermilk and vanilla. 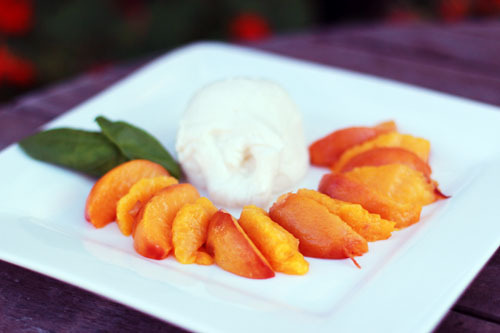 Stir in flour, baking powder, salt, soda until just moistened - do not overstir! Bake 1 hour 15 minutes, until top and edges are browned and the center looks cooked (Jane note: I have dark, non-stick bread pans and my bread is done at ~45 minutes). Cool 5 minutes in pan and then on wire rack. Jane Note: I couldn't find my second loaf pan last week, so I did one loaf and the rest as muffins. The muffins came out great and cooked in about half the time as the loaf. Half of the batter yielded 11 muffins, so a full batch would be about 22 muffins. That all said, I do think I like the loaf form better. Menu time already? Unreal. This summer is flying by. – Hot dogs and Cracker Jack…Nate and I are going to a Giants game! – I’m not planning anything…I’m just going to see what I feel like and go from there because, you know, I only have to cook for myself – woohoo! Your turn! Please share your menu for the week, in whatever form fits your style! I was happy to see you all come back last weekend after taking a break for 4th of July…keep the menu awesomeness coming! 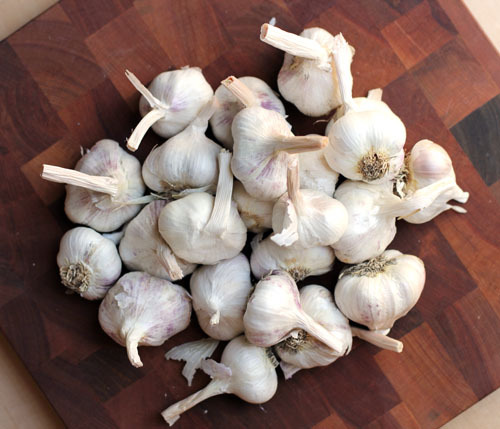 Fresh Garlic…and LOTS of it! Last week when it was time to put my order in for this week’s CSA bag, garlic made its first appearance on the list of available produce. I have been waiting for this moment. I love fresh garlic. But I HATE buying garlic bulbs at the market that end up being old…you know, you cut into a clove and it’s already sprouted green inside. Which happens probably 90% of the time. It seriously makes me bonkers. SO MUCH GARLIC. I am super excited about it, don’t get me wrong…but what am I going to do with all this garlic? I think this giant bag of garlic is just screaming for a Call for Recipes, don’t you? And this Call for Recipes is also a Call for Tips…as in, if you have good tips for storing garlic or ways to use it up that doesn’t necessarily involve a recipe, please share! And, as always, we love it when you share recipes, too! I’ll start us off Roasted Garlic Bulbs. Heaven. So, put your garlic thinking caps on and let’s get this party started.